In London, global sports brand PUMA hosted a press conference to celebrate Usain Bolt’s legendary status and long track & field career. 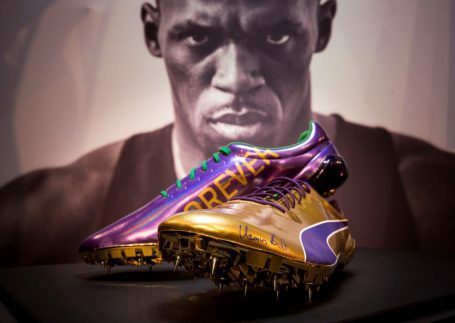 Usain was reminded of key moments in his life that contributed to his legacy, and Usain’s parents surprised him by joining him onstage to present him with a special pair of Bolt Legacy Spikes, commemorating his journey as he prepares for his final race. Wellesley and Jennifer Bolt gifted their son his first pair of spikes back when he began running on the track, so it was only fitting that they were there to hand him the final pair of his professional career as well. These are the Bolt Legacy Spikes made exclusively for London and they have design details from key moments in his journey. The right shoe is labeled “Forever” and has the alpha symbol to represent the beginning of his career. The shoe is in the purple and green from William Knibb High School where he started on the track. The left shoe is labeled “Fastest” and has the omega symbol to represent the finish of his career. The left shoe is gold to represent his successes and the sock liner highlights his major achievements since 2002. The tongue of the spikes have Usain’s signature and a mark of his classic pose embossed, the Jamaican flag is also incorporated to show the love he has for his home country. Usain Bolt will wear his Legacy Spikes on the track in London and limited pairs are available at select retailers.